Watt Drive offers a complete program of electric, electronic and mechanical drive technology both in the form of individual units or as a complete drive system. We offer perfectly coordinated standard products! By expanding on top of our modular gear system we are able to meet the highest demands of our customers with the most modern motor and inverter technologies. Our special tooth formation and surface finish guarantee the highest bearing capacity resulting in smaller gear wheels at the same torque. In this manner smaller gear units are possible with an excellent power spectrum.Watt Drive geared motors really are spectacular! 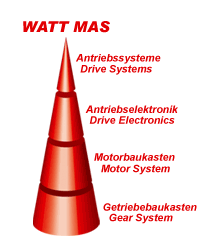 Unbelievable price on Modular Drive System MAS in Shah Alam (Malaysia) company Watt Euro-Drive (Malaysia), Sdn. Bhd..